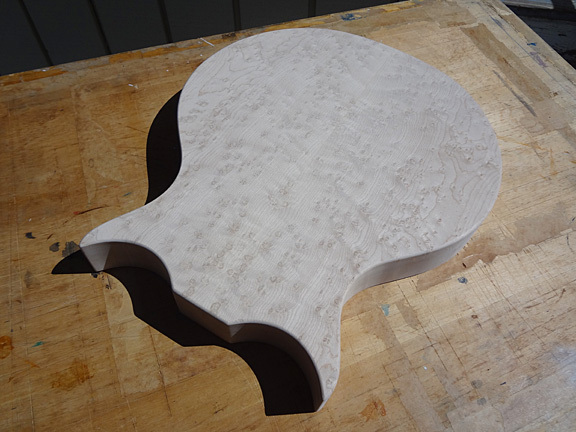 I’m pleased to announce that Ashley Kingman Model #2 is underway! It was ordered by Bruce “Rooster” Lipski who lives in Virginia and is a bonafide vintage guitar devotee and tone aficionado. 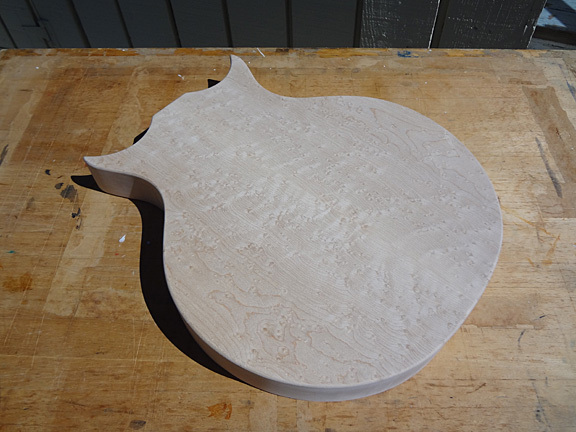 Here’s some photos of his guitar body in progress. Gerard is playing his Tele through a 14 watt Victoria Trem d’ la Trem amp with a 15″ Eminence Legend speaker. The amp’s tone knob is set at 12 o’clock. No effects are engaged. Strings are D’Addario flatwounds. Ashley is playing through a Tweed Deluxe clone with a 15″ speaker. Amp cabinet hand-built by Ashley. Strings are D’Addario flatwounds. 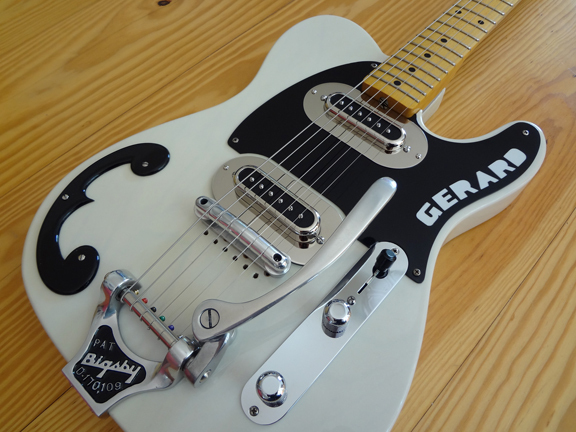 My second set of Magna-Sonic pickups went to Gerard Egan. I work with Gerard at Santa Cruz Guitar Company and he and his wife Carolyn play western swing and honky-tonk with their band The Carolyn Sills Combo. Check them out, Gerard is one heck of a player. Gerard brought me his Tele, which had Lollar Charlie Christian pickups and a custom pickguard and armrest by T.K. Smith. Here’s a photo of what his guitar looked like when I got it. In order to install the Magna-Sonics, I needed to hot rod it a bit. 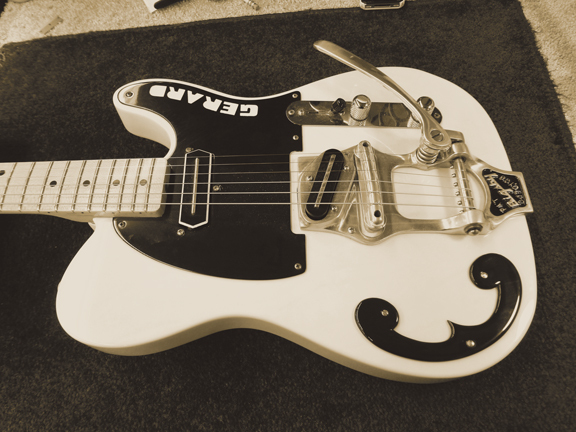 I chopped down the Bigsby B16 tailpiece and routed the body and pickguard to accommodate my pickups. Lastly, I finished it off by shaping the pickguard to echo the outline of the bridge pickup’s mounting ring. Here’s a photo of the finished guitar. Gerard was thrilled with how it turned out and I have to agree, it does look sharp. 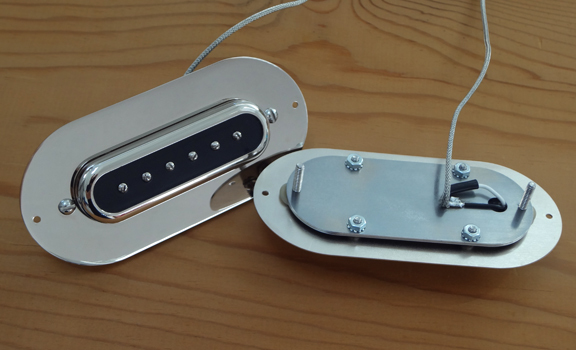 One of the goals I had when I began building Ashley Kingman’s guitar back in 2011 was to also recreate the Magnatone pickups he’d been using for years. Those pickups were a huge part of Ashley’s sound and I was surprised that no one had ever tried copying them before. In fact, I couldn’t find any information on them at all and when I asked various people about them, I got wildly differing opinions as to their origins. Undeterred, I started making some pickups anyway. I basically built a conventional single coil that would fit inside a Magnatone-style cover. This was all guesswork considering I hadn’t actually taken Ashley’s old pickups apart. In the end, the prototypes looked right and sounded OK, but Ashley and I both agreed they didn’t sound “exactly” like his original Magnatone pickups. The Magnatones had a chimey-ness that I just wasn’t getting. At this point Ashley sent the prototypes back to me for fine tuning and put his original Magnatone pickups in his new guitar. I tried out a few more design variations but I was quickly running out of ideas. Sensing my frustration, Ashley said, “To hell with it, let’s take my pickups apart and find out what’s inside. It’s the only way we’re gonna get it right.” Until then, we had avoided dissecting his Magnatone pickups for fear of damaging them. Remember, Ashley was still relying on them nightly for his sound and it would be nearly impossible to find a replacement pickup if one broke. So we got together and proceeded to do some serious exploratory surgery on one of his old Magnatone pickups. The scariest part was drilling out the rivets that held it together. I think I forgot to breathe during that part. Somehow I managed to drill them all out and Ashley did the honors of gently removing the chrome cover. This is how it must have felt when they opened King Tut’s tomb, I thought. Excited and relieved, I was finally able to see how the pickups were constructed, and it was nothing at all like what I expected! I thoroughly analyzed and documented every component so this time I could get it exactly right. After that we had to put Ashley’s guitar back together so he could play a gig the next night. I was greatly relieved when we tested the reassembled pickup and it performed flawlessly. Of course all this this meant going back to the drawing board and starting over. It took me another year of sourcing materials and fabricating parts before I had a set of pickups ready for Ashley to try out. He installed the new pickups in his guitar this January and hit the road with them. The deciding factor, he said, would be how they sounded on stage with the band. All told, it took me almost two years of work to perfect this pickup. There’s no way I could have pulled it off without Ashley’s help and considerable feedback. Just the fact that he’s playing them is the biggest compliment I could wish for. I plan on using them on all the guitars I build in the future and also offer them as a custom aftermarket pickup for players seeking a different sound. It’s been quite a while since I’ve posted anything on my blog, so I think it’s time I let everyone know what I’ve been up to for the past year and a half. 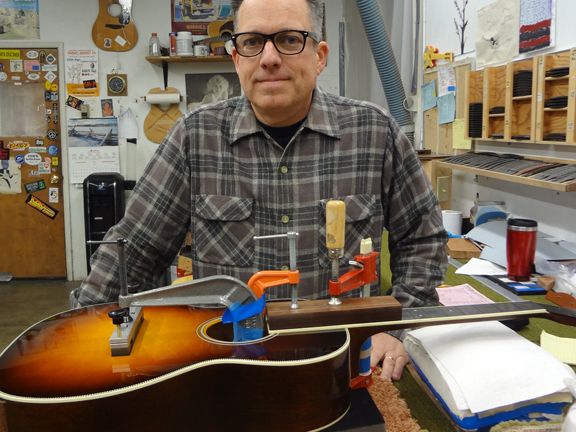 Soon after completing Ashley’s guitar, I got a full-time job at Santa Cruz Guitar Company. I work in their set-up department and my specific job is “gluing up” the guitars. What that means is that I attach the necks and bridges to the bodies. It involves checking the final neck angle and fine tuning the dovetail neck joint. Once the fit is perfect, I “glue it up” and it’s one step closer to being a completed guitar. SCGC makes world-class acoustic guitars and so far I’ve had the privilege to work on some really amazing instruments. Here’s a photo of me at my bench. “Good job mate.” – A.K. 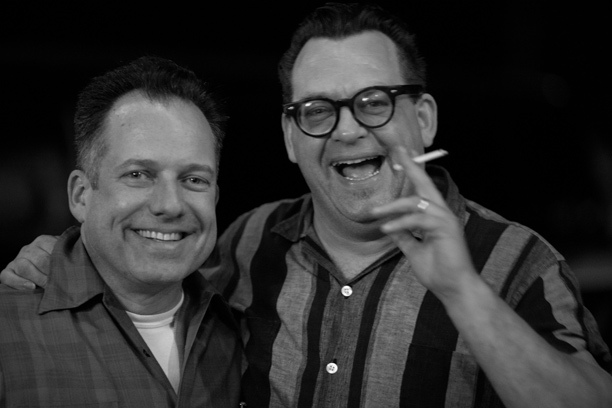 Ashley and me celebrating the completion of his guitar. August 3rd, 2012.